Ladbrokes Tip: Look for horses coming out of the CF Orr Stakes at the same track and distance a fortnight earlier. The Futurity Stakes is one of three Group 1 Melbourne Autumn Racing Carnival features held at Caulfield Racecourse on Ladbrokes Blue Diamond Stakes Day in late February each year. The weight-for-age feature runs over 1400m and offers $500,000 in total prize money. There are three elite level races at the meeting, which is headlined by the two-year-olds facing off in the Group 1 Ladbrokes Blue Diamond Stakes (1200m). The traditional lead-up race into the Futurity Stakes is the Group 1 Ladbrokes CF Orr Stakes (1400m) conducted at the same track and distance a fortnight earlier. From 2013-18 five of the Futurity Stakes winners came off a CF Orr Stakes run, including Black Heart Bart (2017) who did the double and the also Darren Weir-trained Brave Smash (2018) who improved on a lead-up third on the Orr Stakes. This autumn’s edition of the Futurity Stakes took place on Saturday February 23, 2019. The official Futurity Stakes Results 2019 and Finishing Order will be published below when the race is run and won on Saturday February 23, 2019. Futurity Stakes betting is normally dominated by horses coming off a win with all but two of the nine Futurity Stakes winners from 2010-18 not having won their lead-up race. The CF Orr Stakes is the best guide to Futurity Stakes odds and favourites in the markets have a nice recent record with seven saluting for the punters from 2010-2018. In-form mares also usually sit high up the Futurity Stakes betting markets with four mares beating home the boys from 2007-2018. 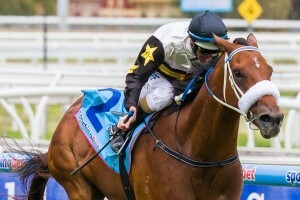 The Futurity Stakes 2019 betting odds will be available below as soon as markets on the Ladbrokes Blue Diamond Stakes Day support act are out. Moment Of Change (2014) is a recent winner of the CF Orr Stakes – Futurity Stakes double. Photo: Race Horse Photos Australia. The Futurity Stakes field limit is 16 starters, but the weight-for-age classic has only run at capacity once since 1983 back in 1986 when the Bart Cummings-trained three-year-old Campaign King won. The race usually attracts horses of all ages however the Group 1 Ladbrokes C.F. Orr Stakes (1400m) also run at Caulfield two weeks earlier is the traditional lead-up. Many horses target the CF Orr Stakes – Futurity Stakes double and the double has been achieved four times since 2010 with Typhoon Tracy (2010), All Too Hard (2013), Moment Of Change (2014) and Black Heart Bart (2017). Nominations are taken the Monday before the race with the final Futurity Stakes field of acceptances released on the Wednesday. The best Futurity Stakes tips are to look for horses coming off a Group race win especially the CF Orr Stakes winner at the same track and distance a fortnight before and to look for horses drawn in barriers 4 – 6 as those gates produced six winners between 2010 and 2018. Other good Futurity Stakes betting tips include backing the favourite and steering away from runners that didn’t have their final lead-up in a Melbourne race. Our insider Ladbrokes’ Futurity Stakes 2019 betting tips will be detailed below the week of the race so stay tuned for the gallopers to back and sack in the autumn Group 1. The Futurity Stakes form guide shows punters the trainers, jockeys, barriers and other crucial information on the horses in the field. The guide shows the CF Orr Stakes is the best form to follow into the Futurity Stakes field each year with 10 winners of the latter coming out of the earlier Caulfield clash from 2005-2018. Other important Futurity Stakes form guide facts to consider include the solid form of three-year-olds over the past two decades, the strong record of trainer David Hayes and the winning strike rate in the race of jockey Damien Oliver who boasts four wins to date. A link to our comprehensive Futurity Stakes 2019 Form Guide will be provided below the week of the race. The Futurity Stakes results and finishing order showing the placings of all the runners in the field along with the winning margins, trainer, jockey and time are out when the race runs at Caulfield Racecourse as part of Ladbrokes Blue Diamond Stakes Day. The results also show the successful Futurity Stakes exotics like quinella and trifecta combinations. Favourites have dominated the Futurity Stakes results over the past decade as have last start winners and notable champions of the race include More Joyous (2011), all Too Hard (2013) and Black Heart Bart (2017).